A Theory of Justice is a work of political philosophy and ethics by John Rawls, in which Rawls attempts to solve the problem of distributive justice (the socially just distribution of goods in a society) by utilising a variant of the familiar device of the social contract. The resultant theory is known as "Justice as Fairness", from which Rawls derives his two principles of justice: the liberty principle and the difference principle. First published in 1971, A Theory of Justice was revised in both 1975 (for the translated editions) and 1999. In A Theory of Justice, Rawls argues for a principled reconciliation of liberty and equality that is meant to apply to the basic structure of a well-ordered society. Central to this effort is an account of the circumstances of justice, inspired by David Hume, and a fair choice situation for parties facing such circumstances, similar to some of Immanuel Kant's views. Principles of justice are sought to guide the conduct of the parties. These parties are recognized to face moderate scarcity, and they are neither naturally altruistic nor purely egoistic. They have ends which they seek to advance, but prefer to advance them through cooperation with others on mutually acceptable terms. Rawls offers a model of a fair choice situation (the original position with its veil of ignorance) within which parties would hypothetically choose mutually acceptable principles of justice. Under such constraints, Rawls believes that parties would find his favoured principles of justice to be especially attractive, winning out over varied alternatives, including utilitarian and right-libertarian accounts. According to Rawls, ignorance of these details about oneself will lead to principles that are fair to all. If an individual does not know how he will end up in his own conceived society, he is likely not going to privilege any one class of people, but rather develop a scheme of justice that treats all fairly. In particular, Rawls claims that those in the Original Position would all adopt a maximin strategy which would maximise the prospects of the least well-off. Rawls bases his Original Position on a "thin theory of the good" which he says "explains the rationality underlying choice of principles in the Original Position". A full theory of the good follows after we derive principles from the original position. Rawls claims that the parties in the original position would adopt two such principles, which would then govern the assignment of rights and duties and regulate the distribution of social and economic advantages across society. The difference principle permits inequalities in the distribution of goods only if those inequalities benefit the worst-off members of society. Rawls believes that this principle would be a rational choice for the representatives in the original position for the following reason: Each member of society has an equal claim on their society’s goods. Natural attributes should not affect this claim, so the basic right of any individual, before further considerations are taken into account, must be to an equal share in material wealth. What, then, could justify unequal distribution? Rawls argues that inequality is acceptable only if it is to the advantage of those who are worst-off. These principles are lexically ordered, and Rawls emphasizes the priority of liberty. "liberties not on the list, for example, the right to own certain kinds of property (e.g. means of production) and freedom of contract as understood by the doctrine of laissez-faire are not basic; and so they are not protected by the priority of the first principle." Rawls' claim in (a) is that departures from equality of a list of what he calls primary goods—"things which a rational man wants whatever else he wants" [Rawls, 1971, pg. 92]—are justified only to the extent that they improve the lot of those who are worst-off under that distribution in comparison with the previous, equal, distribution. His position is at least in some sense egalitarian, with a provision that inequalities are allowed when they benefit the least advantaged. An important consequence of Rawls' view is that inequalities can actually be just, as long as they are to the benefit of the least well off. His argument for this position rests heavily on the claim that morally arbitrary factors (for example, the family one is born into) shouldn't determine one's life chances or opportunities. 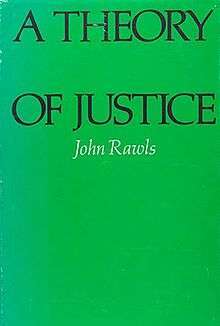 Rawls is also keying on an intuition that a person does not morally deserve their inborn talents; thus that one is not entitled to all the benefits they could possibly receive from them; hence, at least one of the criteria which could provide an alternative to equality in assessing the justice of distributions is eliminated. The stipulation in (b) is lexically prior to that in (a). Fair equality of opportunity requires not merely that offices and positions are distributed on the basis of merit, but that all have reasonable opportunity to acquire the skills on the basis of which merit is assessed. It may be thought that this stipulation, and even the first principle of justice, may require greater equality than the difference principle, because large social and economic inequalities, even when they are to the advantage of the worst-off, will tend to seriously undermine the value of the political liberties and any measures towards fair equality of opportunity. In 1972, A Theory of Justice was reviewed in The New York Times Book Review by Marshall Cohen, who described the work as "magisterial", and suggested that Rawls' use of the techniques of analytic philosophy made the book the "most formidable" defense of the social contract tradition to date. He credited Rawls with showing that the widespread claim that "systematic moral and political philosophy are dead" is mistaken, and with providing a "bold and rigorous" account of "the principles to which our public life is committed." Though he suggested that it might take years before a satisfactory appraisal of the work could be made, he noted that Rawls' accomplishments had been compared by scholars to those of John Stuart Mill and Immanuel Kant. However, he criticized Rawls for "looseness in his understanding of some fundamental political concepts." Economist Amartya Sen has raised concerns over Rawls' emphasis on primary social goods, arguing in Inequality Reexamined (1992) that we should attend not only to the distribution of primary goods, but also how effectively people are able to use those goods to pursue their ends. Norman Daniels has wondered why health care shouldn't be treated as a primary good, and some of his subsequent work has addressed this question, arguing for a right to health care within a broadly Rawlsian framework. Philosopher Gerald Cohen, in If You're An Egalitarian, How Come You're So Rich? (2000) and Rescuing Justice and Equality (2008), criticizes Rawls' avowal of inequality under the difference principle, his application of the principle only to social institutions, and what he sees as his obsession with the using primary goods as his currency of equality. Sen critiques and attempts to revitalize A Theory of Justice in The Idea of Justice (2009). He credits Rawls for revitalizing the interest in the ideas of what justice means and the stress put on fairness, objectivity, equality of opportunity, removal of poverty, and freedom. However, Sen, as part of his general critique of the contractarian tradition, states that ideas about a perfectly just world do not help redress actual existing inequality. Sen faults Rawls for an over-emphasis on institutions as guarantors of justice not considering the effects of human behaviour on the institutions' ability to maintain a just society. Sen believes Rawls understates the difficulty in getting everyone in society to adhere to the norms of a just society. Sen also claims that Rawls' position that there be only one possible outcome of the reflective equilibrium behind the veil of ignorance is misguided. Sen believes that multiple conflicting but just principles may arise and that this undermines the multi-step processes that Rawls laid out as leading to a perfectly just society. ↑ Follesdal Mertens, Andreas (2005). Real world justice: grounds, principles, human rights, and social institutions. Dordrecht: Springer. p. 88. ISBN 9781402031410. ↑ Marshall Cohen. "The social contract explained and defended". Nytimes.com. ↑ Nozick, Robert (1993). Anarchy, State, and Utopia. Oxford: Blackwell Publishers. pp. 183–231. ISBN 0-631-19780-X. ↑ Bloom, Allan (1991). Giants and Dwarfs: Essays 1960-1990. New York: Simon & Schuster. pp. 315–415. ISBN 0-671-74726-6. ↑ Wolff, Robert Paul (1977). Understanding Rawls: A Reconstruction and Critique of A Theory of Justice. Princeton, New Jersey: Princeton University Press. pp. 3–212. ISBN 0-691-01992-4. ↑ Sandel, Michael (1998). Liberalism and the Limits of Justice. New York: Cambridge University Press. p. 14. ISBN 0-521-56741-6. ↑ Okin, Susan Moller (1989). Justice, Gender, and the Family. New York: Basic Books. p. 9. ISBN 0-465-03703-8. ↑ Arrow, "Some Ordinalist-Utilitarian Notes on Rawls' Theory of Justice, Journal of Philosophy 70, 9 (May 1973), pp. 245-263. ↑ Harsanyi, "Can the Maximin Principle Serve as a Basis for Morality? a Critique of John Rawls' Theory, American Political Science Review 69, 2 (June 1975), pp. 594-606. ↑ Rawls, John (2005). Political Liberalism. New York: Columbia University Press. pp. 182–3, 261. ISBN 0-231-13089-9. ↑ Rawls, Justice as Fairness: a Restatement, p. 97. ↑ Sen, Inequality Reexamined (Cambridge, MA: Harvard University Press, 1992). ↑ Daniels, "Rights to Health Care: Programmatic Worries," Journal of Medicine and Philosophy 4, 2 (1979): pp. 174-191. ↑ Daniels, Just Health Care (Cambridge University Press, 1985). ↑ Cambridge, MA: Harvard University Press, 2000. ↑ Sen, Amartya (2009). The Idea of Justice. New York: Belknap Press (Harvard University Press). p. 52–74. ISBN 978-0-674-06047-0. ↑ "The great philosophers get musical twist". Oxfordmail.co.uk.